Facebook is now rolling out a new feature to US users of its Messenger app on iPhone: the ability to make free voice calls. The new feature was noticed by The Verge, which confirmed with Facebook that it was rolling out to US users in the current version of the app today. This follows the testing of the feature in Canada earlier this month, when it also launched voice messaging in the Messages app. To initiate a free call, you find the user that you’d like to chat with, tap the ‘i’ button on their profile and tap the Free Call button. The call will be placed over either WiFi or cellular data connections and if the user has the Facebook Messenger app installed, they will receive a push notification that allows them to see that you’re calling and accept the call. Currently, the ability to initiate these calls is only available to US (and Canadian) iPhone users as the Android app does not have the capability. The implications of Facebook offering free voice calls over data are obviously interesting. The network has some 1 billion users in its graph and the connections between those users are getting more and more likely to be able to link you to the people that you call via voice every day. Sure, you have to be contacts with people in order to call them, but why wouldn’t you be Facebook friends with the people that you call the most? Provided that you actually use Facebook at all, that is. The endgame here is carrier plans that include less emphasis on phone minutes (and text messages) than ever before, and a far greater focus on getting you to pay more for data. If the carriers are going to get turned into dumb pipes one product tweak at a time, you can bet that they’re going to pull every penny they can out of us on the way down. 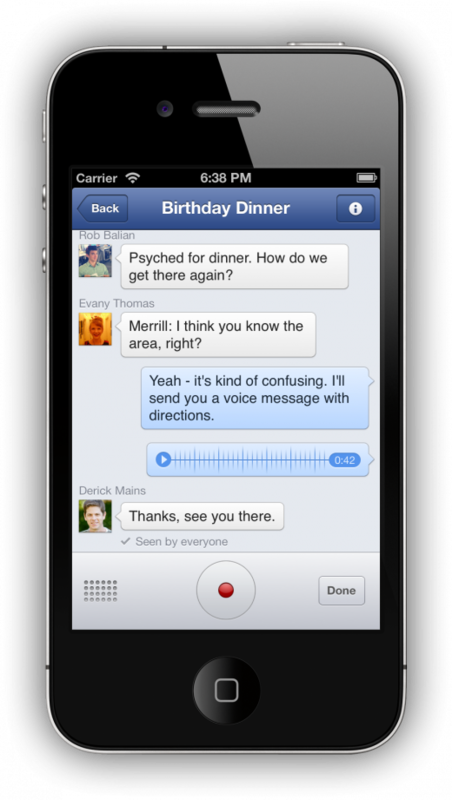 With services like Messenger, iMessage and more already eroding texting, voice calling is also now taking the hit. If Apple were to tweak FaceTime to allow voice-only calling in addition to tweaks like this one to Messenger, it could be completely marginalized in no time at all. If you don’t have the free call button yet, you should be getting it shortly, as long as you’re using the iPhone version of the app and you’re in the US, that is.